The chart above shows, how the relationship between USD/DKK and 2-year yield spread has unfolded since 2012. 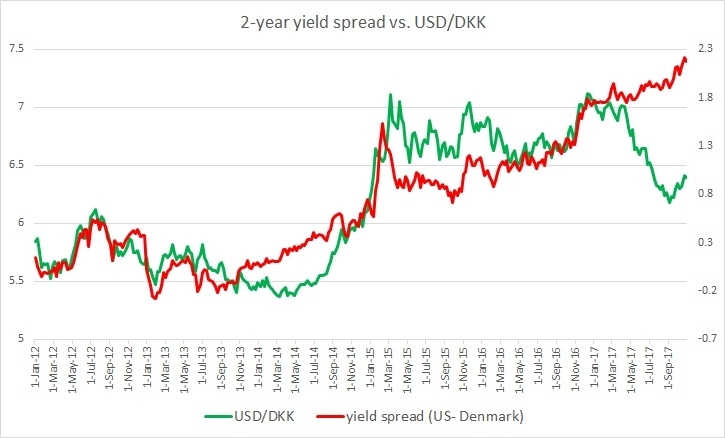 It can be seen that the pair and the yield spread between 2-year treasury and 2-year Danish government bond have enjoyed a very close relationship. The Denmark’s National Bank (DNB) began reducing interest rates (lending rates) in the aftermath of the ‘Great Recession’ of 2008/09. The interest rates declined steadily from 550 basis points in 2008 to just 105 basis points in 2010. The lending rates were increased to 155 basis points in 2011 as the impact of the ‘Great Recession’ was less severe. However, the interest rates were reduced again in the aftermath of Eurozone debt crisis. Since the end 2011, DNB reduced rates from 155 basis points to just 20 basis points in 2013 and was further lowered to just 5 and it remained at the level. In addition to that, in 2013, DNB pegged Czech Koruna with the Euro at 27 per euro. It can be seen from the chart as while DNB started reducing rates again between 2011 and 2015 and maintained dovish tone, and the US Federal reserve indicated and began to wind up its asset purchases, the 2-year yield spread widened in favor of the dollar by more than 200 basis points and the exchange rate declined from 5.4 per dollar to 7.1 per dollar. However, since the beginning of this year, there have been speculations in the market that the Denmark’s National Bank (DNB) would soon follow other central banks in the region, namely the Czech National Bank (CNB) that increased interest rates by 20 basis points. The speculation is being fuelled by higher inflation that reached a five-year high of 1.5 percent in August. Inflation further increased to 1.6 percent in September. However, DNB hasn’t increased rates since it lifted rates by 10 basis points (bps) to -0.65 percent. In our review in August, we noted that a strong divergence is visible as the yield spread has moved 14 basis points in favour of the dollar this year, while Danish Krone has strengthened almost 700 pips against USD. We suggested that such divergence would not be sustainable in the medium term. Hence, we expected hawkish commentaries from DNB, in absence of which the exchange rate could decline favouring the dollar. The spread was then at 198 basis points and exchange rate at 6.23 per dollar. In our last review in early October, we noted that the exchange rate has responded somewhat to the yield spread but the divergence is still at large. Since August review, the spread has widened by 6 basis points in favour of the dollar, while Krone has declined around 100 pips against USD. The spread is currently at 204 bps and exchange rate at 6.33 per dollar. Since that review, the divergence has further narrowed. The spread has widened by another 13 bps to 217 basis points, while the exchange rate has weakened by another 60 basis points to 6.395 per dollar. With central banks changing their monetary policy outlooks, we highly recommend a regular following of the yield spread.